Does your child want a horse or pony? Some ponies and horses make better children’s mounts than other. There really is no best breed for a child or a beginner. The decision should be about what is safe and there are safe, and not so safe individuals within every breed. For a small child, a pony breed works well because their size isn’t as intimidating and if they do fall off, they won’t have too far to go. Ponies may be better size-wise, but it’s important to remember that a pony is still very strong and wily, and even a Miniature may be quite a handful, even for an adult. With all of this in mind, here are a few breeds that are most commonly ridden by children. 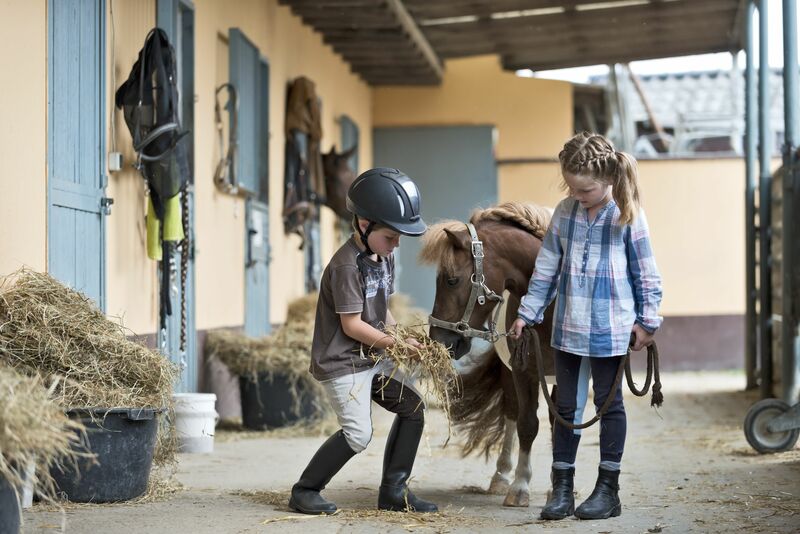 Shetland Ponies are a popular choice for children because of their diminutive size. Remember though, the Shetlands were developed to be a hardy draft animal, so despite their small stature, they are very strong and will use that to their advantage with a much weaker rider. Nevertheless, a well behaved Shetland Pony can be a good mount for a young rider, especially with lots of adult participation. Welsh Ponies of all sizes make good mounts for children. One could go from child to adulthood riding a Welsh Pony or Cob. They are very hardy and smart, but perhaps not quite as wily as Shetlands. Their larger size makes them easier for an adult to handle, and the larger ones can be ridden by adults who can school them for children. The Welsh Pony & Cob Society of America sponsors reward programs for young children, and there are many shows for Welsh Ponies, both under saddle and in harness. The Pony of the Americas has the distinction of being a North American breed developed specifically for child riders. They are a mixture of horse and pony breeds, most notably Appaloosa, which is evident in the breed’s spotted coat pattern. There are a lot of ponies out there of mixed pedigrees that are great children’s mounts. Grade ponies may not be a breed, but there are still lots of opportunities for showing, learning, and fun on a grade pony. Minis are fun to handle and drive. They can be shown in competitions similar to agility courses for dogs and can be driven by adults and children. Due to their small size, they are not suitable for riding. Horses tend to have a steadier temperament than those with Thoroughbred bloodlines. Quarter Horses make great family horses. The American Quarter Horse Association has many programs for youth riders. Appaloosas can make great kids horse’s, especially those with Quarter Horse bloodlines. Children love the beautiful coat patterns and the colorful history of these horses. The Appaloosa Youth Association has many programs for kids including showing, judging competitions, speech, and art contests and exchange and scholarship programs. Paint Horses are a stock horse breed, used for farm and ranch work. Many have Quarter Horses in their pedigrees. Like the Quarter Horse, they can be the ideal all-around horse with a quiet temperament and eye-catching color. The American Paint Horse Association has many youth programs.